« Ballintubber Farm allotments, Carrigtwohill, Co. Cork. 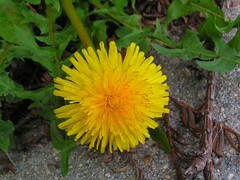 A dandelion is pretty, but can be a pain, photo / pic / image. Yep, you guessed it, Donny Dandelion had arrived with a six-pack, and Chickweed, Shepard’s Purse, Bindweed and Dock were bringing up the rear. These guys are beneficial to lots of insects, and they have their place, but my garden gets a bit crowded if they and the flowers all call around at once. There is a way to stop this weed invasion before they swarm in through the garden gate, and that is to eliminate them at the seedling stage before they get a chance to take root rightly, a sort of pre-emptive strike. One dictionary’s definition of a pre-emptive strike or pre-emptive war is a campaign which is waged in an attempt to repel or defeat a perceived inevitable offensive or invasion, or to gain a strategic advantage in an impending (allegedly unavoidable) war before that threat materializes. A bit of a mouthful, but quite an effective strategy in the garden at least. Now thankfully, the annual weeds such as “Shepard’s Purse” and “Chickweed” are relatively shallow rooted which makes them easy to pull up, hoe off, or dig out. Removing when they are small means less green material to dispose of, plus you stop them before they get a chance to set seed, which prevent further weeds growing and saves you a lot of toil and sweat. Should you have a large area of annual weeds comprising groundsel, annual meadow grass, speedwell and those already mentioned, then you can apply a contact herbicide such as “Weedol ”. Just be very careful about letting the spray drift on to desirable plantings, and follow the manufacturers guidelines to the letter regarding application rates and safety issues. The big guns of the Irish garden invaders are the perennial weeds. The term perennial weed covers such terrors as “Dandelions”, “Bindweed”, “Thistles”, “Docks” and “Couch grass” which is known in the West of Ireland as “Scutch grass”. Simply pulling or hoeing these weeds is ineffective; however digging can be quite successful as long as you ensure every last inch of root is removed from the soil. Any section of the root left in the soil will allow the perennial weed to re-grow, which is why sometimes even the most ecologically friendly gardeners reach for a chemical solution. The most effective type of herbicide to use on perennial weeds is a translocated herbicide . This form of herbicide will travel through the leaves to the furthest tip of the root; for this purpose “Glyphosate” is commonly used. “Glyphosate” based herbicides are available under many names including “Roundup”, “Gallup” and “Touchdown”. Although not as quick to burn off the foliage of weeds as the contact herbicide please remember follow the manufacturer’s guidelines closely regarding application rates and safety issues. All chemicals and herbicides aside, if you have not already mulched your beds and borders in your flower garden, I would advise you to do so after ridding them of weeds. A common mulching material is chipped bark, try mini, medium, or large chip, simply take your pick. A 5 cm layer of this mulch will slow the germination of further weeds, add a temporary pine forest scent to your garden, and as the mulch breaks down it will provide organic feeding matter for your plantings. Weeds in the vegetable plot, well that a post for a whole other day. How have you coped with these weeds, let me know? More debate about this topic on our forum, click Irish gardeners forum. This entry was posted on Sunday, March 15th, 2009 at 4:19 pm	and is filed under Weeds on the allotment and in the garden.. You can follow any responses to this entry through the RSS 2.0 feed. You can leave a response, or trackback from your own site.